(Photo credit: Dibella Entertainment) MASHANTUCKET, Conn. (June 29, 2013) – Powerful World Boxing Association & International Boxing Organization World middleweight champion Gennady “GGG” Golovkin (27-0, 24 KOs) stopped challenger Matthew “Mack The Knife” Macklin (29-5, 20 KOs) with a lethal body shot in the third round, headlining tonight’s HBO Triple-Header, presented by K2 Promotions and DiBella Entertainment, in the MGM Grand Theater at Foxwoods Resort Casino. Golovkin stalked the game Irishman and finished the fight at 1:22 of the third round with a vicious left hook to Macklin’s ribs, sending a strong signal to the entire 160-pound division that the Kazakh is a true force. (21-0-2, 13 KOs) and Brandon “Flawless” Gonzales (17-0-1, 10 KOs) battled to a draw (96-94, 92-98, 95-95) in their HBO debuts. Oosthuizen, the International Boxing Organization (IBO) champion, stormed back to win the last five rounds on two judges’ scorecards. South African southpaw Oosthuizen is rated No. 5 byThe Ring Magazine, International Boxing Federation (IBF) and WBA, while Gonzales is ranked No. 10 by the IBF. In the televised opener, North American Boxing Federation (NABF) super welterweight champion Willie “The Great” Nelson (21-1-1, 12 KOs), rated No. 3 in the World Boxing Council (WBC), successfully defended his title, earning a hard-fought 10-round unanimous decision (97-93, 97-93, 96-94) over WBC No. 13-rated Luciano Cuello (32-3, 6 KOs). Nelson was wobbled twice by the rugged Argentinian, whose previous two career losses were to world champion Saul Alvarez and Julio Cesar Chavez, Jr., and, after building up an early lead after six rounds (59-53, 59-53, 58-56), the 6’4″ Cleveland fighter came back strong to win the eighth and ninth rounds for the edge. Nelson dedicated his fight to the three Cleveland women -Amanda Berry,Gina DeJesus andMichelle Knight – who were kidnapped, abused and held hostage for a decade until they were recently freed. 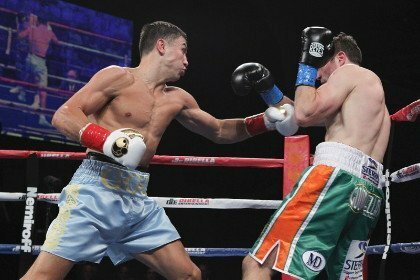 Popular Irish-American boxerDanny “Bhoy” O’Connor (21-1, 7 KOs), who dedicated his fight to the victims of the Boston Marathon bombing, won his seventh straight fight with a hard-fought eight-round decision over toughHector “The Hurricane” Munoz (21-11-1, 14 KOs). O’Connor, fighting out of Framingham, Mass., had the largest and loudest fan-base of the night. Undefeated New Haven prospect Luis “KO King” Rosa, Jr. rolled to his 14th straight victory, taking a unanimous eight-round decision from 65-fight Mexican veteran Jose “Pepe” Beranza. Washington D.C. welterweight Dusty Hernandez-Harrison improved his perfect record to 16-0 with a six-round unanimous decision win over Ben “The Congo Soldier” Ankrah (17-16). Next boxing news: Gennady Golovkin: Superstardom Awaits!